God ! we can't wait!!!!!!! We're busy now sorting out the van hire which we had a stroke of luck with because this week Enterprise had 20% reductions on all vans..
We also sent off the British Waterways licence fee and have now got all the paperwork back for that. We have now sorted out the insurance for Derwent6 including contents, cranage and the transportation. We feel we must recommend Towergate mardon for the way they dealt with us and the professionalism they showed us. We are now trying to gather all our boxes together so they go on the van in the right order for unpacking. Thanks to everyone for all your good luck wishes! This will all happen on Wednesday the 3rd December ........Hurrayyyyyyy! The boat will go in the water and then have to be commissioned and all the checks carried out, so we should take posession of Derwent6 on Thursday 4th December. There are three days for Fernwood to finish Derwent6 and there is still quite a bit to do, but she looks fantastic. We spent all day there Wednesday, Waxing and polishing the paintwork and cleaning the inside so it's a bit easier for launch day. There was still work to do in the engine room but the office desk area was coming on. Stuart and Rob had go t their heads together and worked out the drop down desk thing, which looked fab. The engine has now been running and was tested all the time we were there.. it was very quite under it's engine cover and as you can see there is another cover to go under this yet. So we should hardly hear it. The boat was lovely and warm with the heating boiler running all day on test. and the horn got a blast!!!!!! We checked the table for height and the legs were adjusted, they unscrew for the drop down bed in the dayroom. The table is on legs so we can move it where we like and can be pushed in for when we just walk through. We are still waiting for the freezer here. The headboard had been fitted in the bedroom and looks warm and cosy now. We have insurance, van hire, monies and gathering stuff together to sort out, but our doors are open and we are ready to rumble. Back at the begining of the month, Andy the boat painter had done all the livery on Derwent6 and in conversation we started to talk about interests and found out Andy was a mad Colditz fan. Del used to love Colditz as a boy and still has got a soft spot for it. Andy is involved in the colditz appreciation society , who go out to the castle every year, so when he had to take our doors back for the engine room, we had roses and guess what castle. This fits in with the moder n traditional querky theme we have tried to give Derwent6. The floor just looked fantastic now it had been varnished, and looked even more amazing in the dayroom. It really is starting to feel like a home now and has a lot of character already. He is Al and Julia relaxing in the saloon going through our list of items still not done. Chris had done the back bed board in the dayroom so the squab cover moves back when making the spare bed...The table needs to be fitted which has been made and in the workshop ready for the legs to be done. In the bathroom the heated mirror has now been fitted and the LED's added in the shower. The electric pump and switch for the toilet had been fitted. In the bedroom the memory foam mattress had been made and fitted, and the bed headboard was just being put up. There is a bedside table, full door mirror and the mechanical manual operation of the bed to be done here. The new batteries had arrived as had the buttons (bow and stern) and side fenders. In the cratch the table had been finished by Pete and the covers and cushions had arrived. So it's not long now and launch is very nearly upon us..... We are waiting for a date on the Crane and low loader hire so...........Watch this space! The bad news is that Derwent6 won't be going in the water this weekend or next weekend, but the good news is that the stove has turned up and things are still moving forward. We were looking at ways of keeping dry on the stern of Derwent6 without having one of those pram covers which have to be taken down every time you go under a bridge. We know they are good for storage and keep the complete back of the boat dry but are a pain to put up and down and store if removed. Yes you do look a bit of a knob wearing it, but that is what you do. It is strapped to you using shoulder straps, leaving your hands free, and is also wind and gale proof. You just need to duck to get under the bridges and can even walk around with it attached to do the lock gates. We have been really waiting in limbo over the last week or so. So we were in anticipation as to what we would see when we got to Fernwood this time. What with so much still to do and dates coming and going. But once again we were blown away with our new home. The first thing we were greeted with was that the bow red flashing had been done and the stern deck and tiller swan neck had been painted. When we stepped on board, all the lads (four of them) were working hard to get Derwent6 finished. The first thing we noticed was the LED lighting under the gunnels and the television and speakers fitted. Under the two seater extra storage seats had been added . As you can see the radiator looked fantastic and the dayroom rad looked just as good, although it has come out white in this photo, it is cream. In the galley the doors had been fitted. In the bathroom the toilet had been fitted and was being wired up, all the cupboard doors were added and shower near completion. All we are waiting for now is the bathroom mirror and LED's in the shower. In the engine room there is still a lot of work to do as you can see............ and the engine hasn't been run yet. Andy still has the doors and panels for painting roses and castles in this room and we will be collecting them as soon as they are ready, this should be early next week. The roof had been painted cream. We are still waiting for the Morso Squirrel stove to arrive, but it is winging it's way down to us from Denmark. There seems to be a big demand for these now as more and more multifuel burners are going into homes, due to the present day crisis. Perhaps it should have been ordered in January, but who would want it hanging around the workshop all that time, and who would have predicted a credit crunch... We don't mind waiting !!! Well it's been a busy week trying to arrange van hire, insurance, and bits and pieces for the interior of Derwent6. Due to the fact that Andy the boat painter could not drive because he was recovering from injury, we had to pick him up from Macclesfield and take him to Fernwood....but boy was it worth it.. 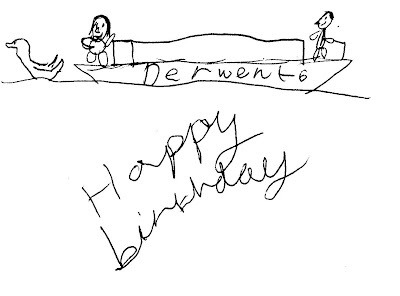 Remember these drawings we made of how we see Derwent6, and how important it was to us we got the font right! On the bow we went for the traditional Shropshire eye. In the cratch (the area in the front of the boat) the table had been set up and the cushions had arrived. You can see Andy painting the bow. While we were there the floor was being laid in the bathroom and it was definitely the right choice. The radiators are now in, but there are still some problems here that need to be sorted out. In the engine room the washing machine and tumble drier are now fitted and the desk area is being formed. This will be a multi-purpose room and a bit of a den. This week we are still waiting for the wood burning stove and freezer to turn up but it is winging it's way to us from Denmark. We took Andy back home and he also took the engine room doors with him for painting.. He is painting the roses, diamonds and Castle. There is a story to tell on them, but I will fill you in when we collect them from Andy. There still seems to be a hell of a lot of work to do, but we are being told launch could be in a couple for weeks....(We can't hold our breath much longer) With a birthday coming up on the 22nd it seems a good day to launch.